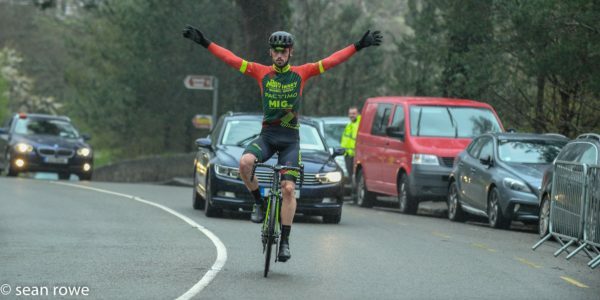 Having combined so well in recent races, Sean Hahessy and Conor Hennebry have reigned supreme in the National Road Series in Blarney. At the end of the Donal Crowley Memorial main event promoted by Blarney Cycling Club, Hahessy ran out the winner. And in 2nd place this time was his Dan Morrissey-MIG-Pactimo team mate Conor Hennebry. Rounding out the podium was another one of the form men of the season to date, Jamie Blanchfield of Panduit Carrick Wheelers. That trio was part of an eight-man breakaway that gain more than three minutes to the next best on a day when the racing split to pieces. The result means Hennebry increases his lead in the series having won the opening round at the Des Hanlon Memorial. Hahessy was also in the escape group that day but a late solo attack by him was neutralised only for Hennebry to get clear to win. Between them, Sean Hahessy and Conor Hennebry have already won six races; Hahessy last victorious just last weekend in Dungarvan.